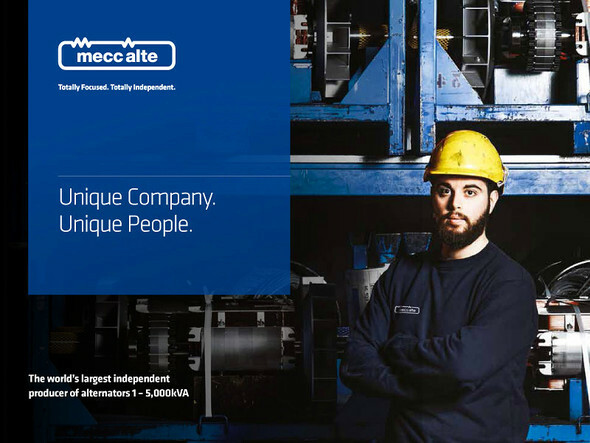 Leading reality in the national scene, fortified by seventy years of experience in the electromechanical field, Mecc Alte is today at its height in the world production of synchronous alternators. Committed daily to research, development and updating activities, Mecc Alte is a testimony to constant improvement in all areas from technology, organisation and quality with its ISO 9001 certification, awarded in 1996, ISO 14001 since 2010 and ISO OHSAS 18001 since 2011. With 54.000 square meters of factory area, almost 1.200 employees and a turnover of approximately 140 million euro, Mecc Alte is a well-established company ready to challenge all the markets in every product sector. Based on highly selected materials and components, tested in conformity to ISO 9001 quality specifications, Mecc Alte production consists of various stages of mechanical manufacturing. Each working phase is carried out making use of state of the art numerical control machine tools whose combination of high performance and great reliability gives maximum dimensional precision. Appropriately designed robots and tooling carry out the machining process to the highest degree of precision which ensures maximum results in the field of quality and consistency. An equally sophisticated system provides the resin impregnation of the windings by means of VPI procedure, which consists of a pressure resin application in vacuum surge tanks. Mecc Alte submits one hundred per cent of its production to a severe final test carried out with automatic equipment able to memorise data and then issue the relative certificates. After the painting, products equipped with CE and C.S.A. certification mark, technical data and inspection reports are ready for the market. Supervisory inspection by certifying institutions, like RINA (Italian Bureau of Shipping), Bureau Venritas and others is possible on demand. As esteemed supplier of leading companies producing generator sets, Mecc Alte assists its customers with a centralised system of computerised management of orders from purchase to delivery. Besides sale organisation, Mecc Alte offers an efficient and timely customer service by authorised centres in Italy and all over the world thanks to its operating affiliated companies in the most interestiong European and international markets and deposit agencies in all Italian regions.